Jetted tubs are amazing additions to any home. They can help with stress reduction, relaxation and sports-related injuries. But when something goes wrong that prevents a jetted tub from working properly, it can be a major source of stress. Luckily, some tried and true remedies for troubleshooting your jetted tub exist. Fixing some of these problems at home is possible. Jetted tubs can have problems. Locate your jetted tub’s user’s manual and have it handy as you troubleshoot the tub. Refer to your manual as necessary throughout the troubleshooting process. Check the jetted tub’s power supply and wiring. If the jetted tub will not turn on or the pumps will not start at all, turn off the tub. Make sure the tub is connected to a power supply, that power in the room is not out and that you have completely depressed the "On" button for the jets. Check the voltage level of the pump as described in your user’s manual. If there is voltage, the pump is broken and must be replaced. If there is no voltage, the pump is not connected to the power supply. Reconnect it. Check the water level. Some jetted tubs will not allow the jets to work unless there is sufficient water in the bathtub. Make sure the water level is above the jets as described in your user’s manual. Let clogged air out of the plumbing line and filter. If you recently drained your hot tub, you may have an air lock. Turn off the jetted tub and loosen the bleed screws at the end of the pump and on top of the filter. Turn the jetted tub on. Repeat a few times until the jets function as usual. Check for obstructions. If the water pressure you are receiving from the jets is less than usual, turn off the power, and locate and examine the pump as described in your user’s manual to check for any obstructions in the pump. Check the filter for clogs. A good test for the filter is to run your jetted tub without the filter. If the water pressure improves, your filter is likely dirty or clogged. Clean the filter according to your user’s manual. Also check for a broken impeller, any broken valves or leaking cracks that could be reducing water pressure. Look for closed jets. If some of the jets are working at a good pressure but others are not working, some of the jets may be closed. Open or adjust them according to your user’s manual. As you examine the jets, check for loose jet seals and obstructions in the nozzles. Repair or replace these according to your manual. 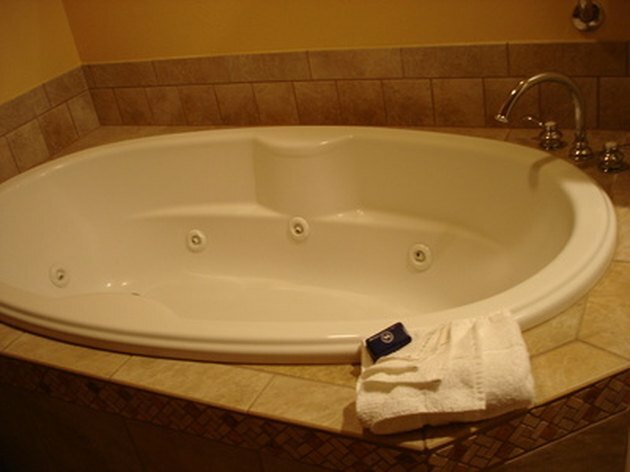 Call a professional for help if your jetted tub is leaking or you cannot solve the problems on your own.